If you are interested in experiencing a part of Canada in contrast to the major cities such as Toronto, Vancouver and Montreal, but also a region very different to rural towns and nature preserves of Alberta, Yukon and Ontario, then Pangnirtung may take your fancy. 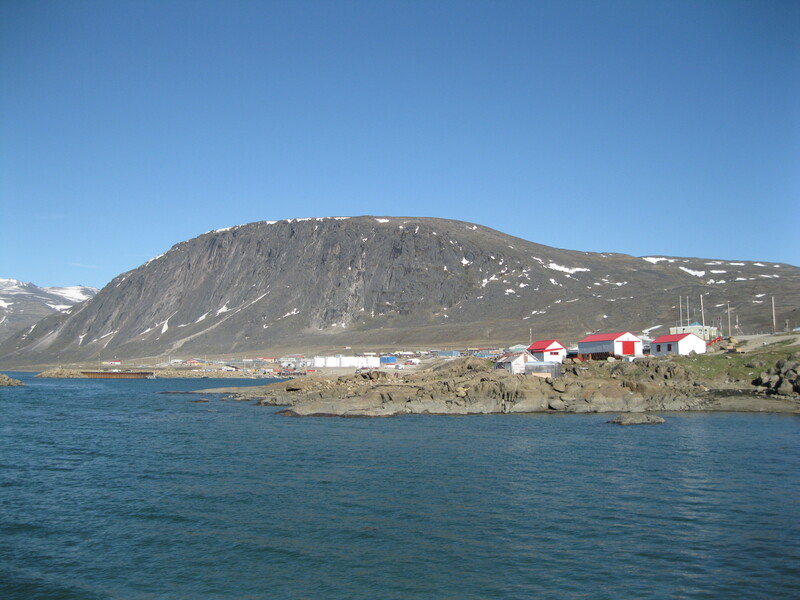 When visiting the hamlet you will definitely get a look into the Inuit region of Canada. 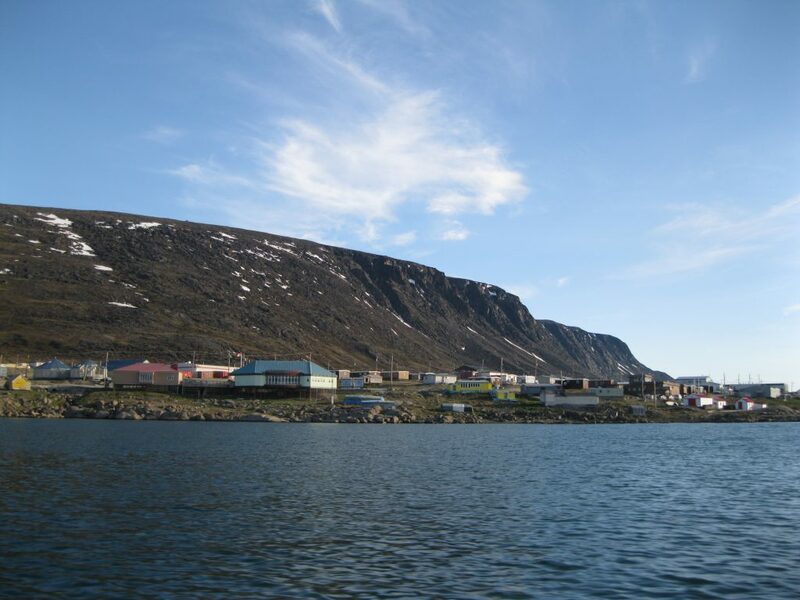 But bear in mind, the main reason and pretty much only reason you would want to visit Pangnirtung as tourist, is to visit the stunning Auyuittuq National Park. A visit to the hamlet and the region is mainly for the adventurers, people who love to explore the outdoors and get a kick out of experiencing something unique and different. That being said, it is quite interesting to stay in the hamlet for a day for the unique experience. One day is plenty as it is a small place and there is not much to see. 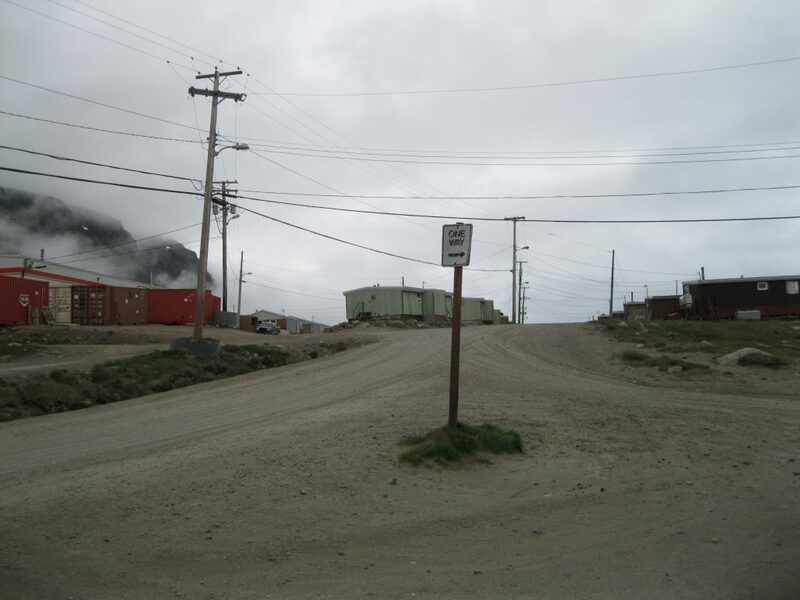 Due to being very isolated it is such an unusual experience to visit a hamlet such as Pangnirtung, especially if you have never been to a remote Arctic area before. You are so far from everything which in itself is quite fascinating. On a clear summer day with blue skies, the hamlet and the surrounding area is quite stunning. Pangnirtung is also nicknamed Pang by the locals and by visitors as it is so much easier to pronounce. The locals say the real name is Panniqtuuq which means “the place of many bull caribou” but they voted against changing the name back in 2005 as Pangnirtung had gotten an international reputation. The population is just under 1,500. 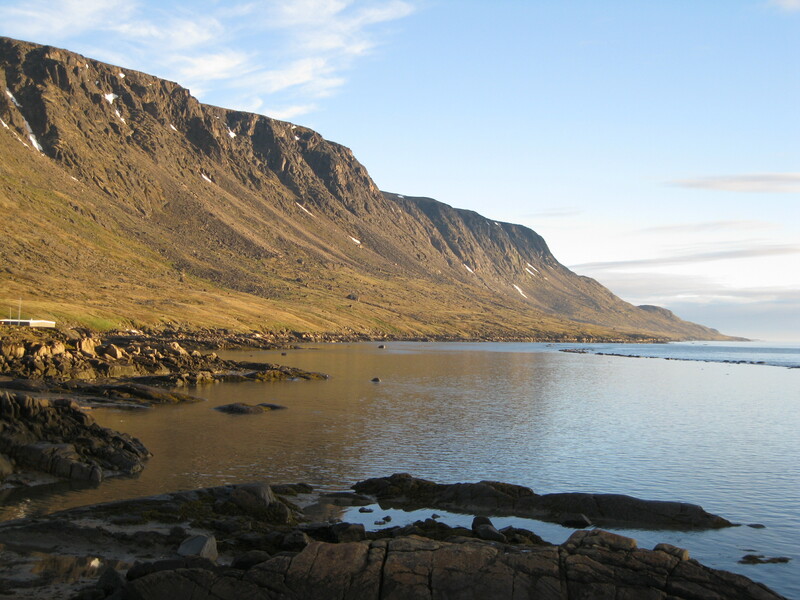 The Inuits and their ancestors have inhabited the area for perhaps as long as 4,000 years. Cumberland Sound was the home of the Thule and Dorset cultures back to the earliest times of human presence in the Arctic. 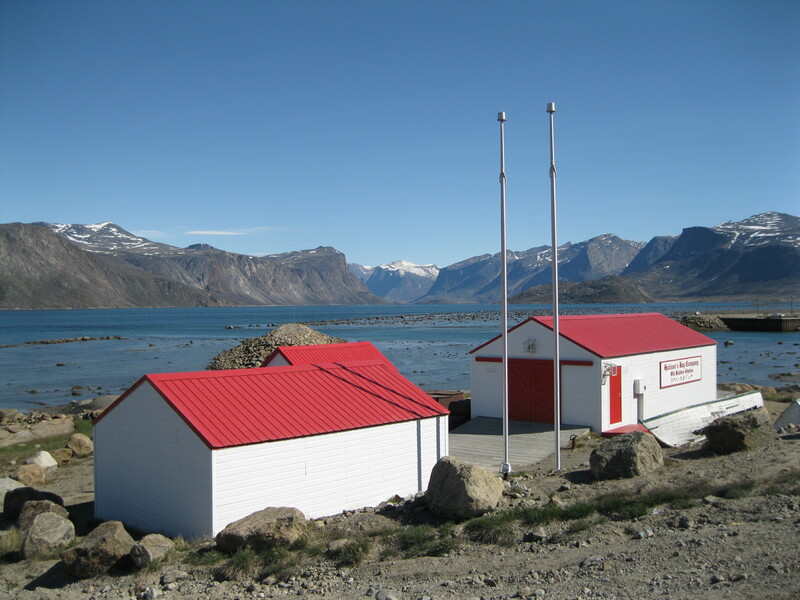 Contact with white Canadians was limited until 1921 where the Hudson’s Bay Company established a trading post in Pangnirtung and two years later the Canadian Mounted Police established an office as well. The first known European to explore the area was John Davis in 1585 who was looking for the Northwest Passage. In 1838 the Scottish whaler William Penny and his local guide found the entrance to Cumberland Sound. This resulted in a big increase in Scottish and American bowhead whalers who would come to the area. At this point the Inuit way of life drastically changed and many of them left their traditional camps by 1850 to work at the whaler stations in Nuvuyen and Kekerten Island. 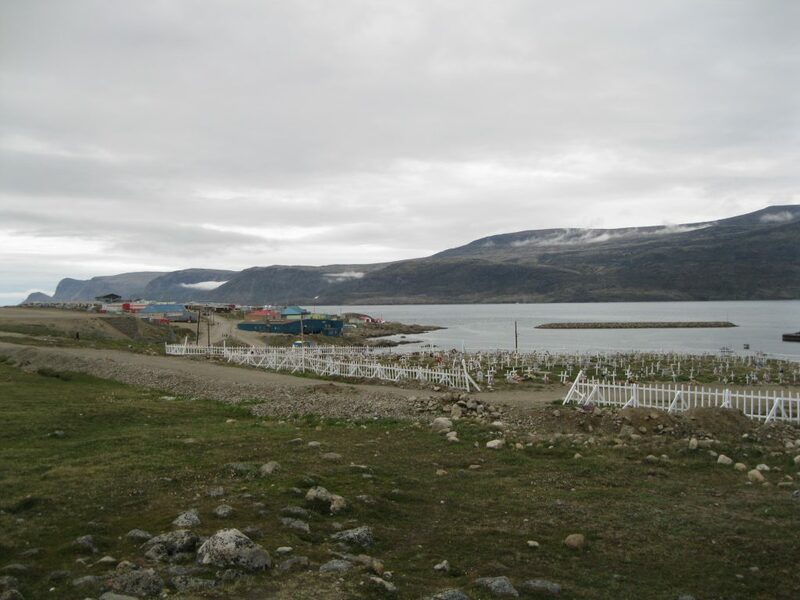 The population of Pangnirtung was quite small until 1962 where a lot of Inuits living on Cumberland Sound moved to the hamlet due to a distemper epidemic killing their sled dogs. The Inuits have had success with their skills within traditional arts such as carvings, sculptures, drawings and lithographs, traditions they still keep alive today. A very interesting historical site is the Hudson’s Bay Company Old Blubber Station, a symbol of the whaling heritage of Pangnitung. Whale and seal fat were processed here. The station consists of four buildings and a platform. The platform was built in 1927 and was used to cut blubber from whale hides and seal skin in to smaller pieces for processing. In 1932 a tramway was constructed to transport hides and supplies from the highwater mark to store houses of Hudson’s Bay Company. A fat grinding shed was completed in 1927 which contained a massive meat grinder that would grind blubber in to slurry which was transported out the back wall into storage tanks. The smallest building is the blacksmith’s shop, built in 1925 from materials from the whaling station on Kekerton Island. From here the whaleboats could be repaired and iron work would be constructed for the pump on the side of the fat grinding shed. The second largest building is the original blubber and storage shed. It was constructed in the late 1920s to store blubber, seal skins and other supplies. The largest structure is the late blubber and hide storage shed, a reconstruction built to replace a shed from the 1940s. The original building was used as a boat workshop and for storage of additional blubber and hides from late in the season. Flying into Pangnirtung from southern Canada, which most likely will be from Ottawa, is very expensive. You will have to fly via Iqaluit, which is the capital of Nunavut, and you need to take into consideration that there may be delays on the route from Iqaluit to Pangnirtung and back again due to weather conditions. Therefore, when planning your trip you have to bear in mind that you may have to stay a night in Iqaluit on your way up and an additional night in Pangnirtung on your way back due to possible flight delays. The challenge is mainly Pangnirtung Airport. It’s a very small airport, based in between two mountain sides where the crosswinds can be strong. No matter where you are in town, the airport is within walking distance, assuming you have a decent level of fitness. That pretty much tells you how small Pangnirtung is. There aren’t many opportunities for accommodation in the hamlet and the options you have are very expensive. Most people stay at the Auyuittuq Lodge which is a pretty nice place and the only hotel in town. The manager and chef of the lodge, Louis Robillard, is a bit of a grumpy and stressful Quebecois character with a broad French accent who has his own unique manner to put it mildly. He is an amazing chef and you will eat well. He has the title of being the chef for former Prime Minister Jean Chrétien during his administration on his resume. The behaviour and antics of Louis and his part-time assistant in the restaurant area are a bit reminiscent of things you may have seen on Fawlty Towers. You may sit quietly and enjoy your meal and then suddenly observe an episode similar to something out of Fawlty Towers with gestures and remarks that could have been right up the alley of Basil Fawlty and Manuel. Louis can be a bit loud and rude, but at the end of the day he is ok, and when he serves lunch and dinner he is in his element. So the reference to Fawlty Towers doesn’t hold water when it comes to the quality of the meals as Louis is a much better cook than Terry of Fawlty Towers. Maybe you should challenge Louis to make you a Waldorf salad when you visit and see what happens. All joking aside you will certainly never forget your lively stay. You have to take it as an experience because there aren’t really any alternatives. It can be a tad annoying at times but take it as a part of the adventure. It is actually quite entertaining from a certain perspective and you will most likely have a laugh about it when you get home and look back on your stay. In the lounge area of the lodge, free coffee is available all days for guests which is awesome. This is a really cool spot to meet other people staying at the lodge and fellow travellers. You will also find some of the local Inuits in the lounge were they come to hang out a bit. They are friendly people, but they will also try to sell their own traditional carvings. Without being too pushy though. As Pangnirtung is so isolated and because Canadians in general are very friendly, you will just automatically start chatting with random people in the lounge area and you will met people from all walks of life. So cool. There will be regulars turning up for lunch and dinner every day. 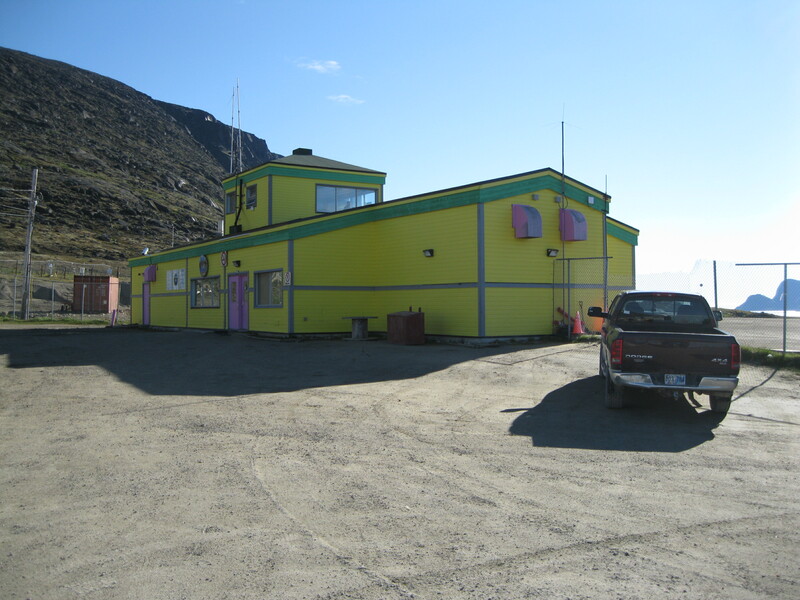 Different workers who have been stationed in the hamlet for different construction projects turning up for a meal, or it could be a dentist or the fire inspector who have flown in for a period to serve the people of Pangnirtung. Baffin Island is huge but it is so sparsely populated that there is one fire inspector for the whole island. He travels around to different towns and hamlets on the island to inspect the fire facilities in public buildings. Also dentists fly around the island as well due to the same reason. Baffin Island is actually the fifth largest island in the world, if you don’t incorporate Australia into the calculation. It’s more than 2.4 times bigger that Great Britain (England, Wales & Scotland). 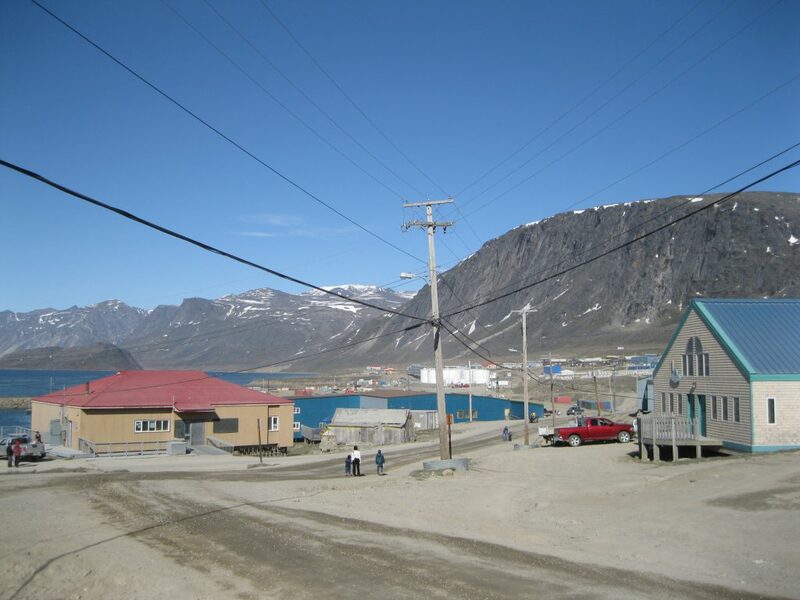 Pangnirtung is based in Inuit country, close to the Arctic Circle. You will therefore mostly find Inuits in the hamlet but also a fair bit of white Canadians. When walking around the streets you will be approached by random Inuits who will try to sell you their art work and carvings. That’s just how it is, so you have to deal with it. Just reject them politely and everything will be fine. There are a fair bit of social challenges in Inuit communities which is really sad. To be blunt, never leave anything valuable unattended in the hamlet, because it will most likely be stolen. Walking around town is quite an experience. It’s all dirt roads. Some residents drive around in four wheeled motorbike vehicles and some in cars which is quite interesting as you can pretty much only drive around in Pangnirtung which is really small. There are no roads leading out of the hamlet. 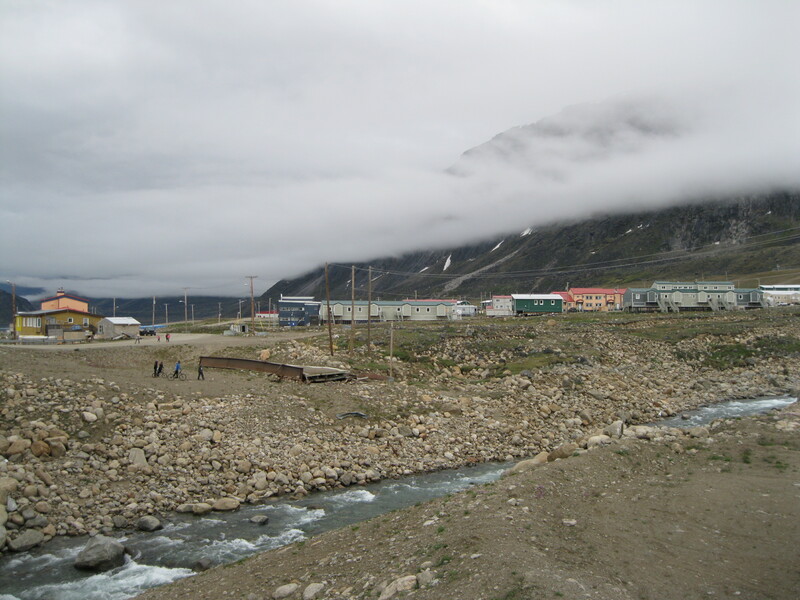 The hamlet is based right at the Pangnirtung Fjord surrounded by beautiful mountain walls. If you are visiting during summer you may be lucky and see some icebergs floating around in the distances if you are down at the shore at the western part of the hamlet. You will have an amazing view of the fjord no matter where you walk around in the hamlet. 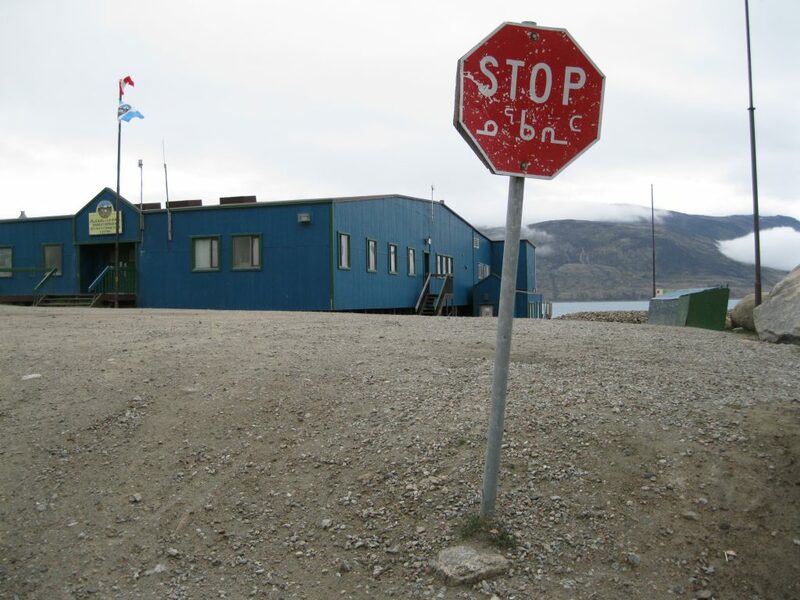 You will also notice that all signs are written in both English and in the Inuktitut alphabet which is the language of the local Inuits. Quite a unique feature of the region. The architecture predominant is very typical for the Arctic region. There are a lot of wooden structures. They are raised on pillars which is done to avoid damages from the permafrost. The homes have also been belted down with hurricane straps due to the very strong winds. The opportunities for shopping are limited with only a couple of supermarkets. If you are into Inuit art work you may find the Uqqurmiut Centre For Arts & Crafts interesting. A little interesting structure is the Fire Hall which has a neighbouring graveyard as well. 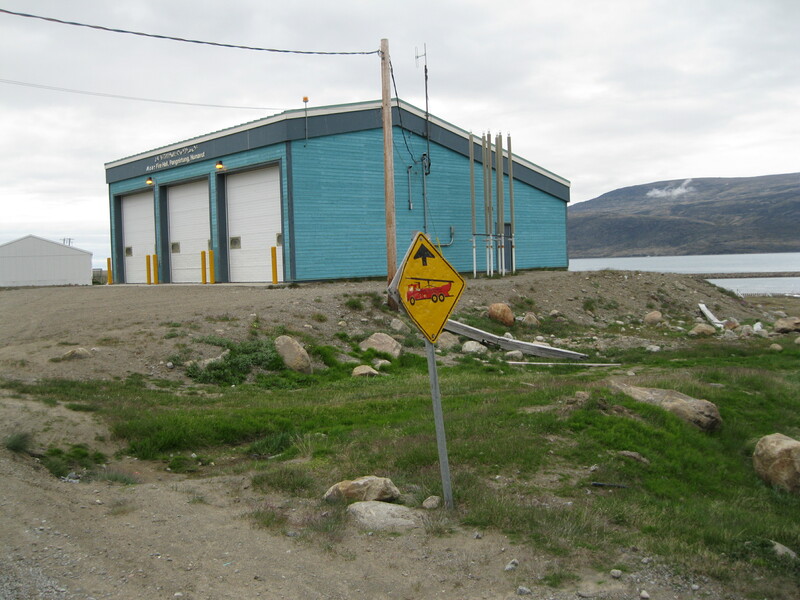 Note the sign outside the Fire Hall of a helicopter which has been completely beaten due to the rough weathering of the Arctic winter. You will see these damaged street signs all over the hamlet. If you walk past the Arts & Crafts Centre to the east you will get to a bridge which you can walk across to to the eastern part of the hamlet. 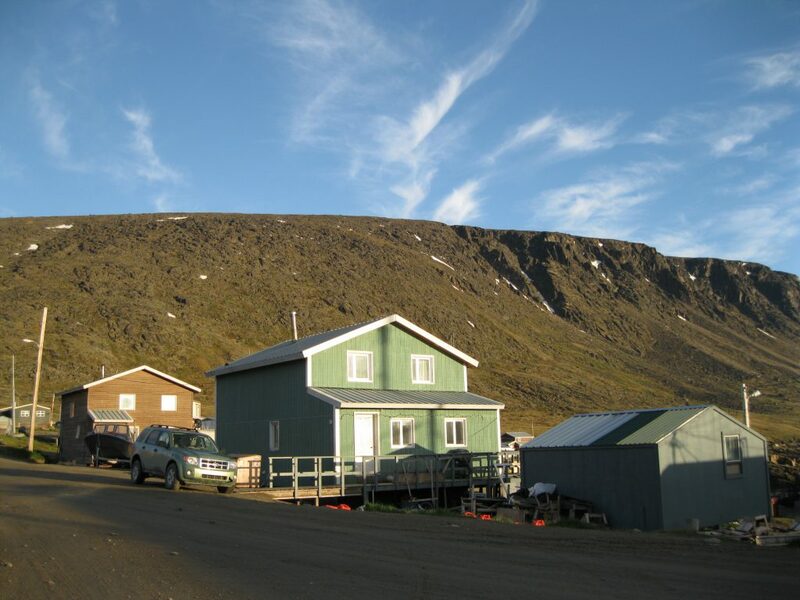 You will get to a residential communities on the other side and get a look into the housing facilities of Arctic Canada. A thing you will notice strolling around is the odd abandoned structure here and there and pieces of wood and metal rubbish lying around on the ground randomly which is not the prettiest sight. But in general the houses in the hamlet look good and well maintained. The Auyuittuq National Park Office is definitely worth a visit as you will get a chance to get some information on the park even if you are not going. If you are visiting the park you have to pay the office a visit to get a briefing on the park and what to be aware of. You also have to register if you are going by yourself. If you are travelling with a tour operator they will do it for you, but you will still have to go for pre-trip orientation. If you are travelling with a tour operator to Auyuittuq National Park, a dinner at the house of a local Inuit may be included. If you get the chance it is highly recommended that you do so. You take the opportunity to try the local cuisine and meet the locals. You won’t be served blubber, but rather dishes like caribou stew and Arctic char, and it will be in a regular home. Good stuff and an awesome experience. This way you will also get to see how the Inuits live and it could just break with some of the prejudice you may have. This is a great way to get to know and understand the culture, ask questions and meet the Inuits in their comfort zone. You will find that the Inuit use a lot of the same modern equipment and gadgets as people in the western world.